Large 1/16 Scale Model. Farmall 450 Gas Hi-Clear Tractor - The Farmall 450 tractor was built from 1956 to 1958 and featured a Fast-Hitch live PTO and Mounted Hydraulics. The Farmall 450 also featured and International four-cylinder gasoline engine with a 281 CID. Rated at 1,450 rpm, it carried a 4 1/8 x 5 1/4 inch bore and stroke. 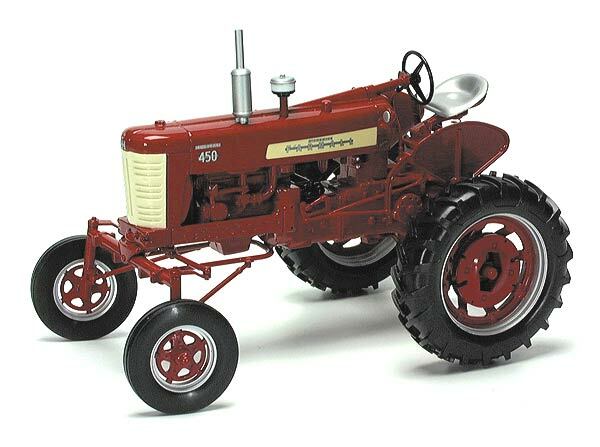 The Farmall 450 was available with gasoline, diesel or LP-gas engines.